In it, people discovered the fullness of Jesus Christ. People gathered together daily, ate their meals together, and shared the Lord’s Supper in an atmosphere of joy and celebration. People gave, and without man-made limitations. They gave everything they owned, everything they were, and every spiritual gift they had received from the Lord, because they loved each other, so no one among them lacked for anything. People saw themselves as equal partners in the Faith, but each with unique gifts, so that no one would contemplate surviving completely in Jesus without the others. And no one among them lorded anything over any other, but each was was seen as an essential part of the whole. People acknowledged that the only hierarchy among them was that some had been in Jesus longer than others, so those had grown deeper and had more to contribute, with those more mature ones afforded the honor they deserved. Jesus alone was the head, and all others were fellow members of the Body, each one a saint, priest, and fellow sojourner. People brought their spiritual gifts to each assembling together, with each person encouraged to share what the Spirit was doing in and through him or her, as the Spirit of God Himself directed. People were in Jesus, who was in the Father and the Holy Spirit as well, all experiencing the fullness of true fellowship and intimacy. And among the people love ruled, with each person lifted up by the other, joined in unity in the Lord. And that love was so compelling that nothing in the world could compare, not even a little. I had a dream, and it seemed so strange, like nothing I had experienced before. And I wanted it to be true, and real, and present right now. But it seems like just a dream. I’ve wrestled with this a bit myself. My wife and I are looking for a church and have been really discouraged. If we go to a church that loves the Gospel we encounter stifling elitism and Spirit-quenching. If we go to a church that loves the gifts we encounter the shallow and loopy. We considered going to a fellowship we were once very close to but, in reaction to certain excesses, they’ve become Cessationist and slightly Hyper-Cal. I’m just at a loss Dan. I want my family to be in an environment that loves each other, values the Jesus of Scripture and acknowledges the power of the Spirit. But, I don’t want to be a raging proud idealist. Thoughts, advice or correction is most welcome. I think you’ve hit the nail on the head. Every church seems to be fixated on one part Church reality, while letting others slide (especially those others that don’t jive with our personal experiences). I don’t know what the answer is yet, but I think one exists. I think that being willing to challenge the status quo is the first step, even if that labels you a troublemaker. They said the same of Jesus, remember. Keep reading. I hope to provide more as I work through this. It is a beautiful dream. One which should leave a constant “aftertaste” in the back of our heart after waking. It’s not “just” a dream, but in order to be fulfilled requires people to be perfectly surrendered to God and to one another. Though that isn’t possible this side of eternity, it is worthy to see how close we could come. Our traditions and fears are holding us back (along with our cultural and societal mantras). I don’t think this is a pipe dream, though. Even if it never perfect this side of eternity, what we see in Acts 2 happened. If so, nothing should stop us. The “Church” we know that there is one church. It is the one Christ is building, yet we have divided what God in Christ has by His blood unified. Heb. 10:25 not forsaking our own assembling together, as is the habit of some, but be encouraging one another; and all the more as you see the day drawing near. Often when Heb. 10:25 is quoted it is used against a brother who has not been to “church” lately. I believe that we as the body of Christ are guilty of forsaking His Church by gathering with only those who agree with our particular doctrinal point of view. Until we see that all who are in Christ are our brothers and sisters and are a vital part of the Church body, we will not live out fully the commission Christ has given us. When we say “come to our church” we reveal how common this attitude of “mine” is pervasive iin the Church. It follows then that gifts, money, time is our own possession rather than stewardship that we will give an accounting for. This thing called church is a jealous and tenacious task master requiring all to play by her traditions and man-made rules – inculcated upon those who unassumingly enter her doors. As a former full time pastor, I had to leave the church kingdom in search of God’s kingdom. It has been a much longer journey than I would have anticipated; filled with disappointment and dissipated dreams. The road is exceedingly lonely as I rarely come across fellow sojourners with the same destination in mind. Leaving the church kingdom with all of its self-sufficiency has brought me face-to-face with aspects of myself that I would have preferred to ignore or even know the existence of. The bankruptcy of my own moral character and the embarrassment of my sins has led me to seek refuge in the backside of the desert. My sole hope is that I would not be stiff-necked and of hardened heart so that God may one day deliver me to the promised land. I think that Christian who honestly seeks to grow must confront church systems some day. It has to occur. What bothers me more than anything about the Church in America is that for all our talk of grace, little or none is offered to the Christian believer. The message is “Do this!” If you don’t heed that message in a timely way as preached, you’re a sinner. There really is no place for just being. We trade the legalism of the OT system for a revised legalism built around the NT. That misses the entire point so badly that when people say they’ve found freedom in Christ, I almost wonder what they’ve found, since they seem to have traded one set of rules for another set of rules that have a veneer of Jesus pasted over them. Grace distinguishes the Church from other religious institutions. I just don’t see a lot of it truly offered with no strings attached. 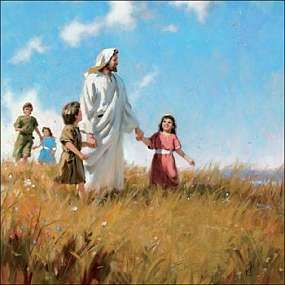 At the beginning of your post, there’s a beautiful painting of Jesus leading a child. I am an editor of a facebook page called “Bible Daily Scriptures and we try to create messages for sharing verses from The Bible several times each day. I would love to include this image. Can you tell me the painter and the source so I can ask permission? Thank you so very much! At the time I saw this image, I do not believe much info was available, but a new search seems to point to an artist named Brian Jekel. I hope that helps. If you find that the image is not reproduceable, let me know, and I will remove it. Thank you.